Thembi Mtshali-Jones is a South African singer, actress and playwright best known for her starring role as aspiring actress Thoko on the CCV sitcom 'Sgudi 'Snaysi, from 1986-1992. She is also known for her starring role as shebeen queen Hazel Dube in the SABC2 sitcom Stokvel, from 2003-2012. She had a starring role as Andiswa Sigcau in the M-Net soccer drama series League of Glory, in 2010; and took over the role of Dineo Nkgatho from Warona Seane for the fourth season of the SABC2 parliamentary drama 90 Plein Street, in 2013. Thembi was born in Durban, eMkhumbane and grew up in KwaMashu Township where she started singing in school concerts. In 2009, she was given a Living Legend Award by the City of Durban and the Premier of KwaZulu Natal. She was a finalist in the Tribute Achievers 2002 Awards in the category of African Excellence in Entertainment & Arts. Thembi had a residency at the Galluadette University in Washington DC in l998. A second residency at the University of Louisville in 2004 was so well received she was made an Honorary Citizen of Louisville by the Mayor, received a vote of thanks by the Senate of Kentucky, and the Governor of Kentucky gave her the highest honour Kentucky can bestow on a civilian by making her a Honorary Kentucky Colonel. As a singer, Thembi has performed with such world-renowned artists as Dizzy Gillespie, Miriam Makeba, Hugh Masekela and Abdullah Ibrahim. She has recorded four albums in her own name, and recorded as lead vocalist with the Sipho Gumede band Peace and the African Jazz Pioneers, on both occasions making one album. Her favourite moment was singing Happy Birthday in Zulu for the then president Nelson Mandela on his 80th birthday in Washington D.C, broadcast live on CNN. 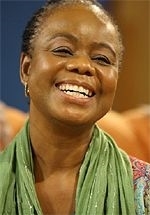 She performed for President Thabo Mbeki and the Parliament after the 2004 State of the Nation Address. She performed lead vocals on the soundtrack to the film Story of an African Farm, which was released by Sony as a CD in 2004,and winning a SAMA Award in 2004.